I apologize for not posting yesterday. As I previously posted, I am in WA for the week spending time with my family. We are spending a couple of days at Seaside OR, one of our favorite coastal getaway spots. I love so much about the WA and OR coast. Flying kites, sand bikes, skim boarding, salt water taffy, wind chimes and so much more. The weather is not quite as good as the photo below but we are still having a ton of fun. 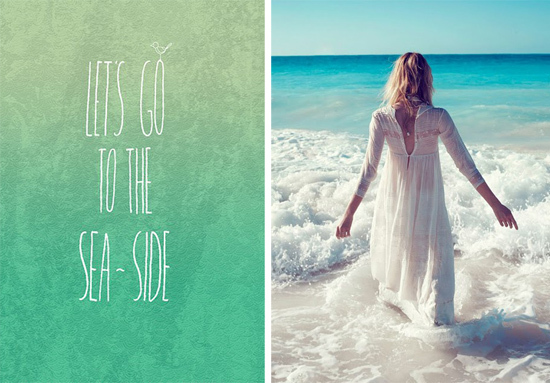 I was so excited when I found the below "Let's Go To The Sea-Side" image at Castles Crowns & Cottages. Do you have a favorite ocean town? ummm Maui? Does that count...lol....enjoy your ocean time!! We spend time every summer in Washington with my family. Earlier this month we stayed on Whidbey Island for a week--so refreshing and beautiful. Langley is worth a visit. Love these images! It makes me want to go to the beach! I absolutely love Charleston - that's probably my favorite. Charleston in the states...I haven't been to the coast yet here in England- but soon as i do-I'll let you know!! !